On February 26 1813, a Friday, between ten and eleven o’clock at night, Percy Bysshe Shelley and his wife Harriet retire to their bedroom on the second floor of Tan-yr-allt, the house they have rented, in the town of Tremadoc in Wales. They are in bed for about half an hour, when Shelley hears a noise, fearing an intruder, he immediately goes downstairs with two pistols. He had loaded the pistols that night having expected to have occasion for them. Hearing the gun shots, Shelley’s servants, who had not yet gone to bed, rush into the parlour. This was about eleven o’clock. They stay there for about two hours – shaken and frightened. Shelley then tells everyone to retire, thinking it impossible the intruder would make a second attack. To be safe, Shelley and and Daniel, his man-servant who arrived that day, will stay up. Three hours pass. It is about four in the morning. It is a dreadful night, the wind is loud as thunder, and the rain falls in torrents. Harriett immediately runs down the stairs. She sees Shelley’s flannel gown and the window curtain have been shot through. A bullet is lodged in the wainscoting. Shelley tells Harriet that he had sent Daniel to see what hour it was, when he heard a noise at the window. He went there, and a man thrust his arm through the glass and fired at him. Thank Heaven! the ball went through his gown and he remained unhurt. Shelley had been standing sideways; had he stood in front of the window the ball would have killed him. Shelley had fired his pistol, but it would not go off. He then aimed a blow at him with an old sword which we found in the house. The assassin attempted to get the sword from him, and just as he was pulling it away Daniel rushed into the room, when he made his escape. The above account of the incident that night uses the language from Harriet Shelley’s letter of March 1813 to Thomas Hookham which is reproduced below. After the incident, Shelley and Harriet, terrified for their lives, had fled to Ireland. What happened on the night of the February 26th remains a mystery. One theory is that Shelley was attacked by a Welsh mountain farmer, who has unhappy at Shelley’s habit of shooting dying sheep to put them out of their misery. Others suspected that Shelley made up the story to avoid paying his debts and escape the country. This is the what Robert Leeson, a local official and owner of a local quarry, believed. In turn, Harriet believed that it was Leeson who was behind the incident. Leeson may have sent someone to look for radical pamphlets so as to charge Shelley with treason. We know that Shelley was being watched by the authorities at his time. Lynn Sheppard, in her very interesting post, speculates that Leeson had been angered by Shelley’s criticism of Leeson’s treatment of his workforce in the quarry. It is clear that Shelley feared for his life since he had loaded his two pistols that night. 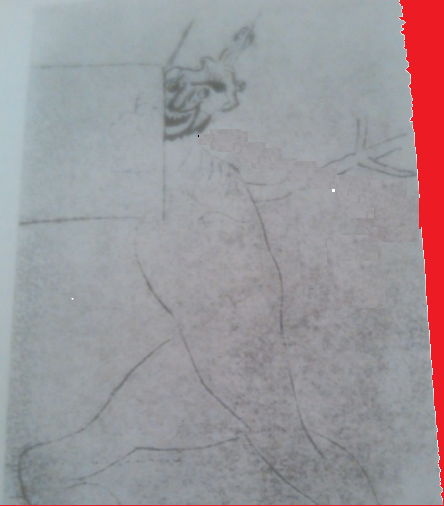 Adding to the mystery is the drawing that Shelley later drew of the intruder, which was variously known as Shelley’s ghost or (as Shelley once said) “the devil”. We arrived here last Tuesday after a most tedious passage of forty hours, during the whole of which time we were dreadfully ill. I’m afraid no diet will prevent us from the common lot of suffering when obliged to take a sea voyage. Mr. S. promised you a recital of the horrible events that caused us to leave Wales. I have undertaken the task, as I wish to spare him, in the present nervous state of his health, every thing that can recall to his mind the horrors of that night, which I will relate. On Friday night, the 26th of February, we retired to Bed between ten and eleven o’clock. We had been in bed about half an hour, when Mr. S. heard a noise proceeding from one of the parlours. He immediately went downstairs with two pistols, which he had loaded that night, expecting to have occasion for them. He went into the billiard room, where he heard footsteps retreating. He followed into an other little room, which was called an office. He there saw a man in the act of quitting the room through a glass window which opens into the shrubbery. The man fired at Mr. S., which he avoided. Bysshe then fired, but it flashed in the pan. The man then knocked Bysshe down, and they struggled on the ground. Bysshe then fired his second pistol, which he thought wounded him in the shoulder, as he uttered a shriek and got up, when he said these words: By God, I will be revenged! I will murder your wife. I will ravish your sister. By God, I will be revenged. He then fled — as we hoped for the night. Our servants were not gone to bed, but were just going, when this horrible affair happened. This was about eleven o’clock. We all assembled in the parlour, where we remained for two hours. Mr. S. then advised us to retire, thinking it impossible he would make a second attack. We left Bysshe and our man-servant, who had only arrived that day, and who knew nothing of the house, to sit up. I had been in bed three hours when I heard a pistol go off. I immediately ran down the stairs, when I perceived that Bysshe’s flannel gown had been shot through, and the window curtain. Bysshe had sent Daniel to see what hour it was, when he heard a noise at the window. He went there, and a man thrust his arm through the glass and fired at him. Thank Heaven! the ball went through his gown and he remained unhurt. Mr. S. happened to stand sideways; had he stood fronting, the ball must have killed him. Bysshe fired his pistol, but it would not go off. He then aimed a blow at him with an old sword which we found in the house. The assassin attempted to get the sword from him, and just as he was pulling it away Dan rushed into the room, when he made his escape. This was at four in the morning. It had been a most dreadful night, the wind was as loud as thunder, and the rain descended in torrents. Nothing has been heard of him; and we have every reason to believe it was no stranger, as there is a man of the name of Leeson, who the next morning that it happened went and told the shopkeepers of Tremadoc that it was a tale of Mr. Shelley’s to impose upon them, that he might leave the country without paying his bills. This they believed, and none of them attempted to do anything towards his discovery. We left Tanyrallt on Saturday, and staid till everything was ready for our leaving the place, at the Sol General of the county’s house, who lived seven miles from us. This Mr. Leeson had been heard to say that he was determined to drive us out of the country. He once happened to get hold of a little pamphlet which Mr. S. had printed in Dublin; this he sent up to Government. In fact he was forever saying something against us, and that because we were determined not to admit him to our house, because we had heard his character and from many acts of his we found that he was malignant and cruel to the greatest degree. The pleasure we experienced at reading your letter you may conceive, at the time when every one seemed to be plotting against us … pardon me if I wound your feelings by dwelling on this subject. Your conduct has made a deep impression on our minds, which no length of time can erase. Would that all mankind were like thee. This entry was posted in 1813, Percy Bysshe Shelley by pastnow. Bookmark the permalink.